← all great changes are preceded by chaos, or how I decided to quit fighting and go under the knife. Unlike LeBron James, I’m not taking up an hour of primetime television to discuss why I made the choice I did with regard to which surgery I am going to have. I am, however, going to take up a little bit of the blogosphere to explain why I chose the procedure I am going to have because several people have asked. Once I began this process of deciding to use surgery to aid in my ongoing battle with my weight, I looked into the three most common types of bariatric surgery: lap-band, gastric bypass and vertical sleeve gastrectomy (VSG). I know folks who have had each of the types of surgery, and had picked up on how they each used the tool they gave themselves to lose the weight they needed to lose. Most of the folks I have known that have had lap-band surgery were quite successful at first. However, some of them found it quite easy to cheat–one woman I know who had it done continued to put back pitchers of beer after being banded, just the same as before she’d had the procedure done. Another woman I know who had it done lost quite a lot of weight, but slowly over the past few years has put nearly every pound back on. And yet another person I know had complications with her band and had to have it replaced. These observations led me to decide that perhaps the band was not a good choice for me. I didn’t want something left behind in my body, I didn’t want to have something that was really high maintenance and that would cost me financially for the duration of the band’s placement, and I didn’t want something that was so easy to cheat. The two people I know who have had gastric bypass surgery have been extremely successful. Both of them lost nearly all their excess body weight and have managed to keep nearly all of it off. Both of them had what is called Roux-en-Y bypass surgery, which involves rerouting the GI tract such that the jejunum of the small intestine (the second segment of this organ) is attached to a pouch created by the surgeon from the stomach. 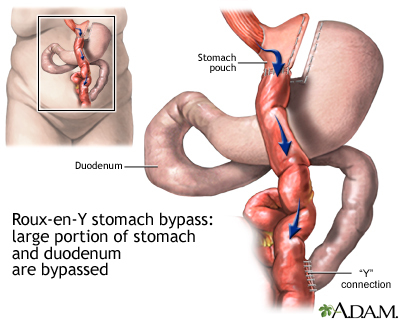 The duodenum (first part of the small intestine), which is key in nutrient absorption, is sewn to an opening created in the jejunum so that digestive juices and enzymes that are made by the remainder of the stomach and pancreas can drain there. The remainder of the stomach is stapled shut at the top. Because the nutrient absorption portion of the small intestine is essentially eliminated from the picture, malabsorption results and rapid weight loss occurs. That’s the benefit. The downsides? There are several, none of which appealed to me in the least bit. Any complex carbohydrates that are eaten travel right on through the intestines, and can cause discomfort and loose stools. Dumping syndrome is also a common occurrence in those who have had gastric bypass. Additionally, since your duodenum is not absorbing nutrients, malnutrition can occur if one does not supplement properly with vitamins and nutrient supplements. As my surgeon said to me at my consult, “You also have to make sure a bathroom is also close by at all times.” That’s good advice, but I was told by another person who’d had this very surgery, “Don’t trust a fart.” I think that’s better advice to follow! As a teacher, it’s not always convenient to leave a group of kids when nature is calling. And as a biology teacher, the malabsorption coupled with complete rerouting of my GI tract did not appeal to me. In my previous post, I explained what a sleeve gastrectomy entails. Essentially, I will be left with a stomach that can only hold a very small quantity of food and liquid at any given time. I will feel full sooner and will not be hungry as often, both of which are things I currently struggle with being. Nothing is left behind except titanium staples and scar tissue. My GI tract remains intact minus 80 percent of my stomach. Dumping? Not going to happen since my stomach is still connected to my duodenum, thus eliminating the malabsorption. I am told by my surgeon that I will come off of my blood pressure meds within a couple of months of surgery, and that I could be off of my diabetes medication within 6 months of surgery. Those two things really appeal to me, because I’m doing this for my health. I just want to be healthy. This surgery appealed to me the most because of the lower risk involved (compared to the bypass) and the payoff: in the end, I am projected to lose 70% of my excess body weight. Is it a guarantee? No, but given that I may only lose 50% of my excess body weight with a band, and that with the bypass I could lose up to 80% of my excess body weight, I’ll take the numbers that come with the sleeve. I don’t judge others who have had the other types of bariatric surgery, because all of us who have turned to surgery to help us with our weight loss each have our own path, and each of us has chosen the path we follow for our own reasons. I am choosing the sleeve because I feel that it is what will work best for me. Fortunately for me, my doctors agree! I am very lucky to have two doctors (my primary care physician and my surgeon) who want what is in my best interest and who want the same thing–they want me to be healthy too. Ultimately, we are all trying to achieve some sort of healthy life that we feel we deserve. For me, this is about achieving health, not a certain dress size. I’ve just completed 40 years on this Earth, and call me selfish, but I want at least 40 more. And I feel like the sleeve is the thing that will help me accomplish that goal. This entry was posted in weight loss surgery and tagged bariatric surgery, choices, decisions, lap-band, RNY, sleeve gastrectomy, surgery, the sleeve, VSG, WLS. Bookmark the permalink.